A paleolake is a lake that existed in the past when hydrological conditions were different. Lakes that have disappeared or shrunk over time are called paleolakes. A lake is a body of water located in a basin that is completely surrounded by land. Most lakes can be found in areas with glacial activity, near mountains, or valleys. These geological formations are usually filled by river water or melting glaciers, although lakes differ from rivers in that their water within does not flow or otherwise move. Despite the fact that lakes may exist for thousands of years, geologists classify all lakes as temporary because at some point during their lifespan they will fill with sediment and cease to exist. Researchers have identified a number of types of lakes, including fluvial, volcanic, tectonic, and organic. This article examines paleolakes. A paleolake is a lake that has existed in the past. Its origin can be dated back to an era when the climate and hydrological conditions of its area were different than today. 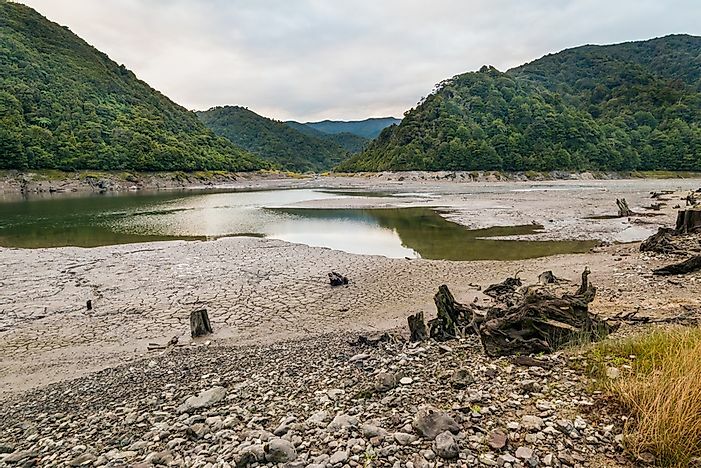 These types of lakes may have already dried up or may be in the process of drying up, or have become filled with sediment, and are now significantly smaller in size than they were in the past. These paleolakes are known as former lakes and shrunken lakes. Depending on the manner of water loss, a shrunken lake may actually have divided into two or more smaller lakes. Some examples of former lakes include Hula Lake in Israel, Lake Balivián in South America, Owens Lake and Tulare Lake in the United States, and Lop Nur in China. Both Owens and Tulare Lake are located in the state of California and are good examples of how common former lakes are in the southwestern region of the United States. Lop Nur is the only former salt lake mentioned. It is located in the Xinjiang Uygur Autonomous Region of China, between the Kumtag and Taklamakan Deserts. This lake eventually dried up due to human activity, which diverted the flow of its source rivers. Shrunken lakes include those that became smaller during prehistory and those that have decreased in size during recent history. A number of shrunken lakes have been documented, including Lake Chad in Africa, Optima Lake and Lake Bonneville in the United States, and Lake Agassiz in Canada. Of these, Lake Agassiz has experienced one of the greatest losses in area over time, as it was once larger than the total area of the present-day Great Lakes in North America. Today, the Agassiz has been reduced to 6 smaller lakes throughout the area: Rainy Lake (250 square miles), Red Lake (440 square miles), Lake of the Woods (1,500 square miles), Lake Winnipegosis (2,000 square miles), Lake Manitoba (2,000 square miles), and Lake Winnipeg (8,500 square miles). Paleolakes are of significant ecological and geological importance. The lake beds of these ancients lakes are often filled with valuable fossils. Additionally, geologists can obtain information about the hydrological changes experienced in a particular area over the life of the lake, including any changes that occurred during prehistoric times. The sites of paleolakes are also often rich in oil, gas, and coal deposits, which are found within the rocks located here.